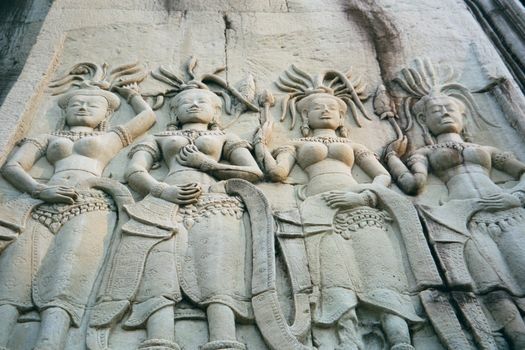 Angkor Wat is the first monument Angkor's visitors see. 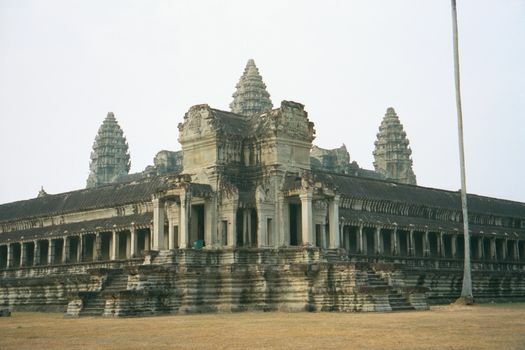 It's also the biggest and therefore (of such is fame constructed) the best known of all Angkor's many monuments. The name translates as "city temple" in the sense of "the city which became a temple." 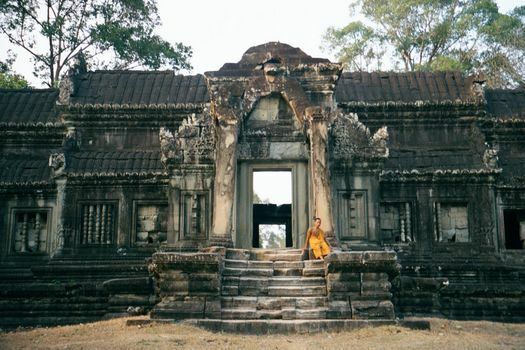 The name in other words came late and refers to the fact that, built in the 12th century as the capital city of a Hindu empire, Angkor Wat became a Buddhist temple. 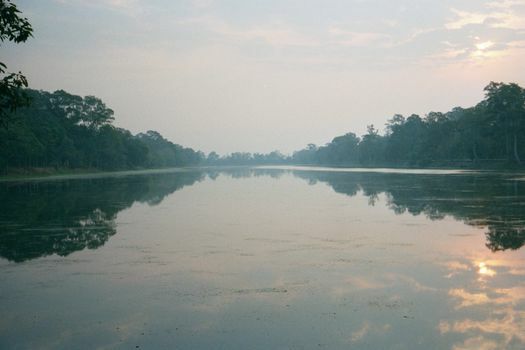 Note on sources: the captions in the numbered Angkor folders are heavily based on Angkor, by Dawn Rooney (Odyssey, 1999), and Ancient Angkor, by Michael Freeman and Claude Jacques (River Books, 1999). 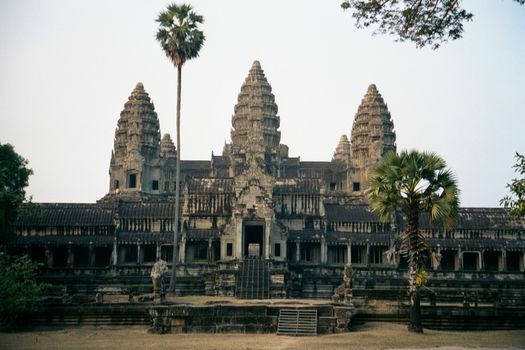 Hindu or Buddhist, Angkor Wat is in the shape of a near-square rectangle enclosing about 500 acres and surrounded by a moat. 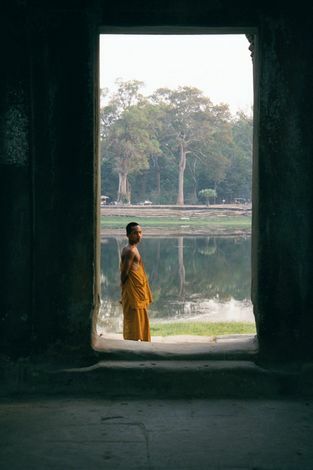 Both in Hindu and Buddhist iconography, the moat symbolizes the ocean that surrounds the world. This moat does the job very well, simply because it is so immense: 660 feet wide and on each side more than a kilometer in length. Here: the south side, looking east. 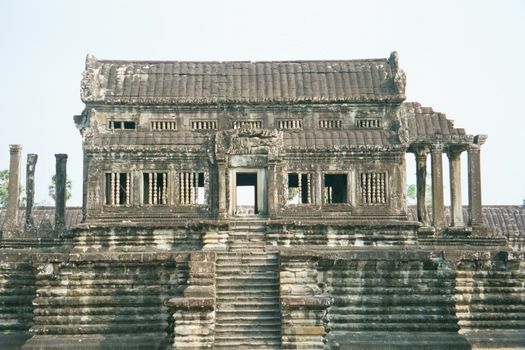 The grand entrance to Angkor Wat is from the west. 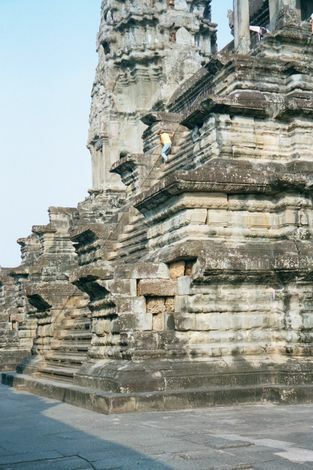 That's contrary to the standard practice of entrances on the east and is apparently an indication that the sanctuary at the center of the city was dedicated to Vishnu, associated with the west. It's also very crowded these days, with a stream of visitors walking eastward along the stone causeway that leads to the temple. To escape the crowd and find a private moment, the view here is of the smaller and merely decorative gate on the south side. It's merely decorative because behind the camera is the unbridged midpoint of the moat shown in the previous picture. 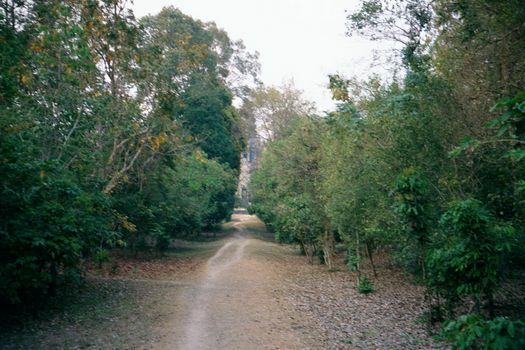 A few steps closer: the temple lies straight ahead a few hundred yards. 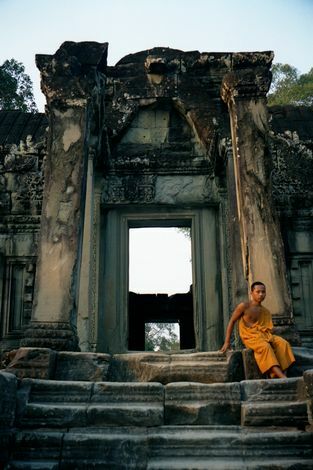 The sandstone of the gate is one of the typical materials used at Angkor. 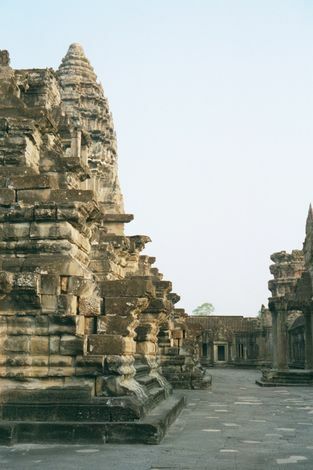 Secular buildings at Angkor were of wood and are entirely gone. 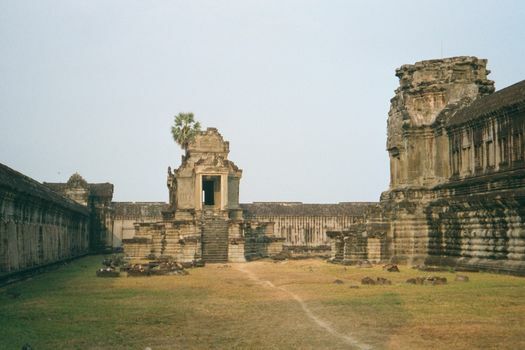 Important buildings, which is to say religious ones, were built of brick or laterite blocks or this sandstone, which was quarried many miles up on the Siem Reap River and then barged downstream. The roofs--here and throughout--are corbelled: that is, they are neither true arches nor supported by wooden frameworks. Instead, the stone (or brick or laterite) is stepped outward at each layer until finally the two sides meet. 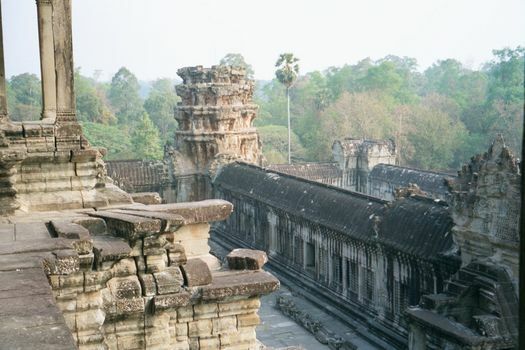 Structurally, it's a poor substitute for an arch, which is why many Angkor roofs are in ruin. 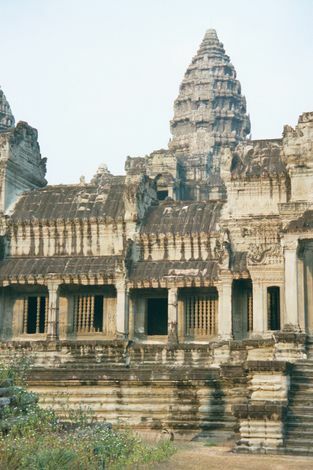 Note the square columns: they're characteristic of Angkor Wat. Round ones--and there are some--were added later. Through the entrance and looking back, toward the south. Heading north, toward the temple. 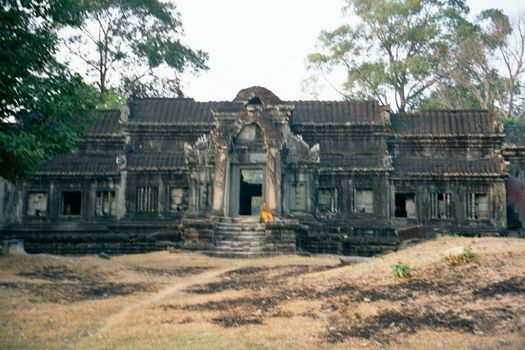 Forest now covers what once was the city of Suryavarman II. Straight ahead and mostly hidden by the trees: the temple proper and its famous lotus-crowned towers. They represent the five peaks of Mt. Meru, the Himalayan peak at the center of the Hindu and Buddhist worlds. Rather than enter straightaway, we've walked clockwise to the causeway on the west. Note the round pillars, built a century after the rest of the temple. 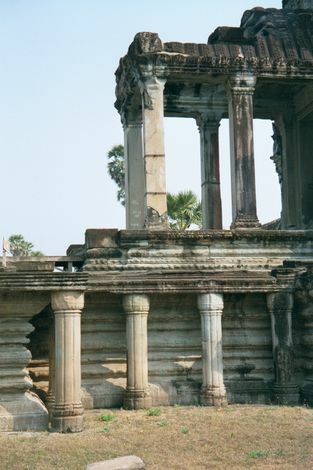 Another detail of the causeway, this time showing not only the round columns but the naga or serpent balustrade, with its vertically flaring multiple heads. This is a motif repeated countless times at Angkor. The body of the serpent is rough with carved scales. Still circumambulating, we've walked around to the northeast corner: in other words, the camera is pointed southwest. The structure covers 20 acres and is laid out as a three-step pyramid, each step walled. Here, you see the wall of the first step. The second tier is not visible. 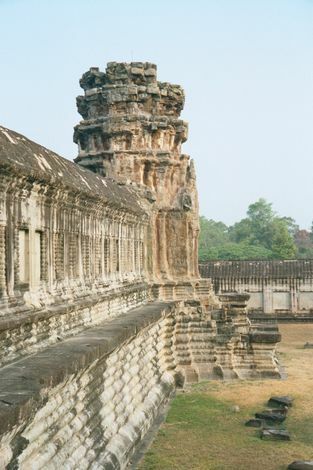 Three of the five towers that crown the third level rise in the background: the five are arranged in a quincunx. 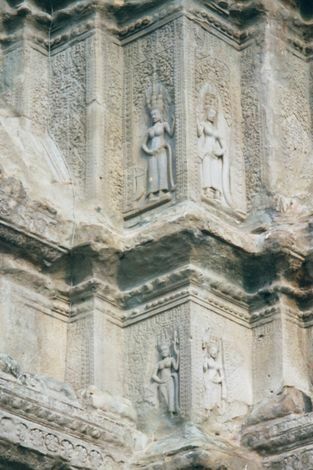 The central sanctuary--once dedicated to Vishnu but now to the Buddha--occupies the central tower. An odd angle: we've drifted south and are looking west, just off-center from the midpoint of the temple. Inside now, and climbing from the first level up to the second. The lotus blossom that once rose from the corner has disappeared, leaving a stone stump. Rather than climb all the way up to the second tier, we've gone back down and around. We're still on the first level, and we're on the south side of the temple, looking west from the midpoint toward one of two so-called "libraries," freestanding structures on the first level. On the right is another tower that has lost its blossom. The same "library," taken from the long side. The proportions are classical, but the roof is supported by corbelled arches. 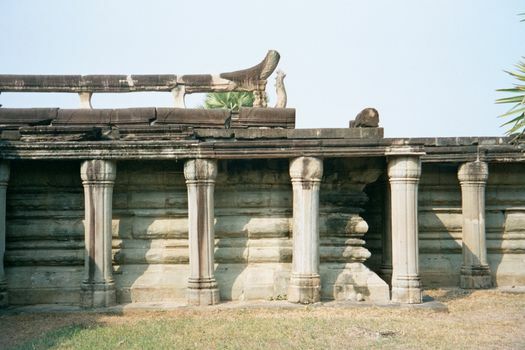 The window balusters are typical of Angkor: of stone, they have been carved to appear as though they are wood. 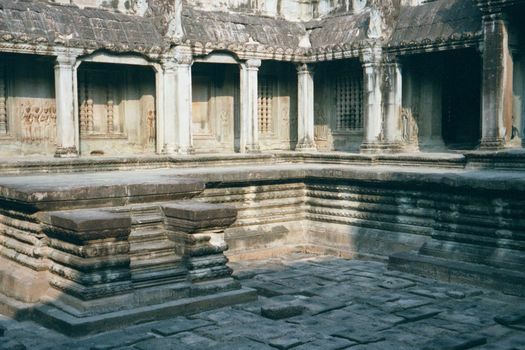 The first level is mostly grass, but between the two "libraries," and on the main ceremonial axis there is a set of four enclosures and, between them, what look like empty pools. The effect is to make the whole temple seem even more massive than it is. Finally we're on the second tier, with its wall on the right and the platform of the third tier on the left. The stairs up to the third level are at a 70-degree angle--no fun. Those on the east side, shown here, do have a modern iron handrail, used here by a visitor with a stitch of common sense. Why so steep? Presumably to mimic the majesty of Mt. Meru. Access to this level was severely restricted: there would have been very few climbers. Up top, finally, and looking southeast over the walls of the second and first levels. 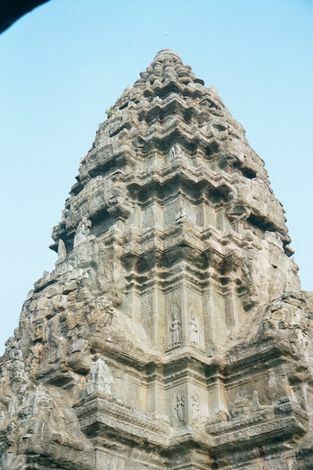 One of the five central towers, carved at the corner with a few of Angkor Wat's nearly 2,000 apsaras or celestial dancers. And still closer, at the risk of pitching backwards off a ledge. 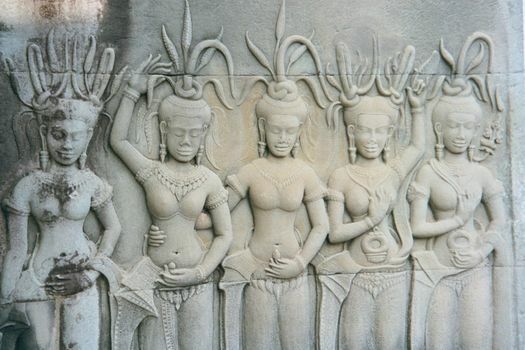 Stylized as the apsaras are, there's a lot of variation among them. 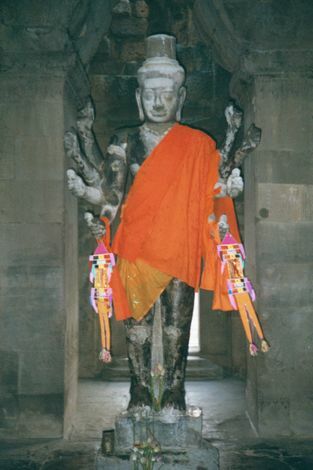 This statue of Vishnu, which stands now at the far western end of Angkor Wat, may once have been in the central sanctuary. The standard image, taken from the western entrance.